Another Valentine’s or Mother’s Day idea. 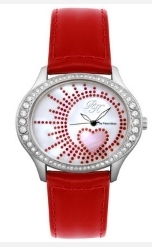 You can snag this Paris Hilton Oval Hearts Watch for only $39 (org $110) at Beyond The Rack through tomorrow (1/26). The site is accessed by invitation only and offers incredible discounts on designer brand fashions and accessories. These are usually high end items that, in some cases, you can snag for a super great price. Some of the things are still too high, even after the big discounts. Those are the items I just “window shop” :). Registration is free to access the site. 100 Mommy Cards For Only $1.99 – Too Cute!